I know that the TeXbook says : "boundary ligatures are automatically disabled in math mode". But I'd like to know if this behaviour can be bypassed. I am creating an environment in order to copy my (young) students' works. For that purpose, I use the frcursive package. But the problem is that, in math mode, the letters are partially displayed because of the boundary ligatures the font designer used in his METAFONT's font files. Thanks in advance if you could help me. As this is presumably only for relatively simple math you could keep in text mode but fake the math. In practice you might want to limit these definitions to a defined environment as for example the fontdimen settings mean that spaces are ignored. Not the answer you're looking for? 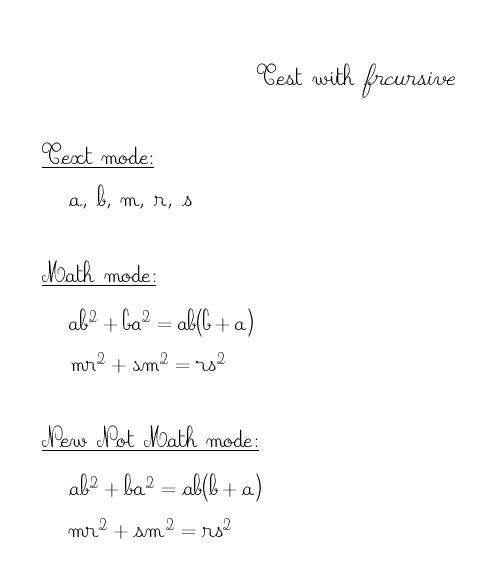 Browse other questions tagged math-mode ligatures metafont or ask your own question. How do I get Libertine + Libertine in math mode + historical ligatures + french-style? How do I disable ligatures?